Whether credit of duty paid outdoor catering services is eligible to assessee? Whether credit required to be distributed on pro rata basis? Whether credit could be allowed on bills address to unregistered unit? Whether independent units could be said to be part of residential complex having more than 12 units for charging service tax? Whether services amount to export of service not liable to service tax? Whether credit can be taken based on endorsed BOE? Whether assessee is liable to pay service tax on supervision of erection and commissioning of plant? Whether credit allowed based courier bill of entry? Whether assessee can exercise option under Rule 6 retrospectively? Whether service tax is payable on the value of material on which VAT has been paid? Whether adjustment of service tax paid under wrong registration number is permissible? Whether credit can be taken as the appellant is not the owner of the capital goods? Whether credit on capital goods installed in state of J & K be availed? Background: Credit on outdoor catering disallowed contending that amendment in the definition of input service restricting credit on outdoor catering service is applicable prior to 1.4.2011. 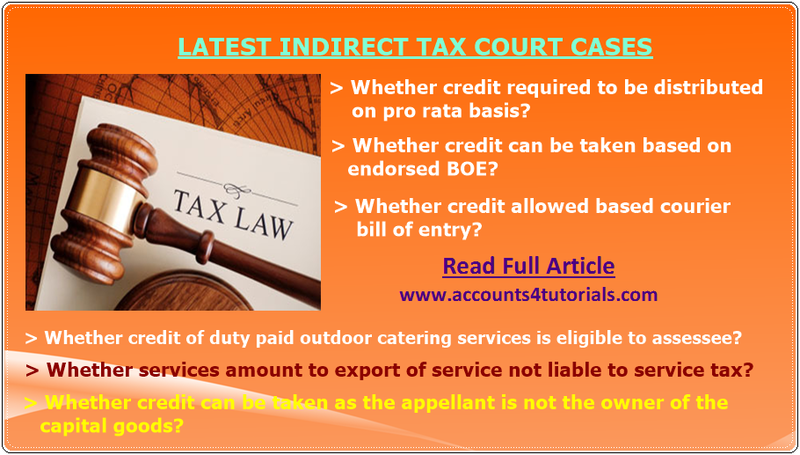 Issue: Whether credit of duty paid outdoor catering services is eligible to assessee? Decision: Outdoor catering services fall within the definition of input service as held in case of Ultratech Cement Ltd by same court. Amendment in the definition restricting the credit on outdoor catering for personal consumption of employee cannot be made applicable retrospectively. Comment: There are few judgments pertaining to period post 1.4.2011 in favor as well as against the eligibility of credit on catering service. One could claim credit and reverse under protest till judicial clarity emerge so that credit is not lost on time limitation. Issue: Whether credit required to be distributed on pro rata basis? Decision: There was no such restriction in Rule 7 of the Cenvat credit Rule during the period of dispute and hence no requirement to distribute credit on pro rata basis of the turnover. Comment: Rule 7 of the Cenvat Credit Rules got amended in 2014 where the manner of distribution based on turnover of different units has been specifically provided. The ratio of above judgment may not be applicable post amendment. Background: Assessee engaged in “Clearing and Forwarding” availed credit on input services on basis of bills having address of its other unregistered unit. Service tax was paid from premise where output services have been provided. Issue: Whether credit could be allowed on bills address to unregistered unit? Decision: There was no lapse in payment of tax and filling of Return. Other unit also belongs to the assessee. Once the substantive provisions are complied with, credit cannot be denied on technical ground. Comment: Department objects to credit availment on technical grounds during audit. Courts have consistently held that credit cannot be denied on technical grounds. Background: Appellant is Cooperative Bank engaged in banking and financial service out of which interest on loan is exempted service. It availed credit of Rs. 3,585/- on common input services. On being pointed out, it reversed entire credit along with 24% interest. Department contended that no intimation was made under Rule 6 for choosing a particular option hence reversal needs to be made @ 8% of value of exempted service (apprx exempted turnover 4cr). Issue: Whether particular option under Rule 6 of CCR can be chosen when no intimation made to department or is it mandatory to opt for reversal at fixed percentage of exempted turnover? Decision: Intimation to department for opting a particular option is procedural non compliance. When assessee had reversed entire credit along with 24% interest, it cannot be compelled to follow the option of reversal at 8% of exempted turnover. Comment: Department always insist for following option which results in highest reversal. Mere failure to intimate is procedural non compliance and cannot take right to exercise particular option most beneficial to assessee. At times, disclosure in returns could also be considered as sufficient compliance of disclosure. Background: Appellant engaged in constructing independent units in a colony. Department contended that service provided covered within residential complex service and liable to service tax. Issue: Whether independent units could be said to be part of residential complex having more than 12 units for charging service tax? Decision: It has been held during hearing of stay application that independent units constructed in a colony are not covered in construction of residential complex, accordingly, granted waiver of service tax taking prima facie view. Comment: Post negative list, requirement of having 12 units have been done away. Now exemption could be claimed if construction has been done for individual residential unit not part of residential complex. Site approval plan could be guiding factor to decide whether each unit is independent or part of complex. Department raised demand alleging that services are not export of service and payment received from Indian buyer cannot be termed as received in foreign currency. Issue: Whether services amount to export of service not liable to service tax? Decision: Services provided to foreign supplier is export of service. Where commission is paid by buyers to assessee instead of commission along with price first remitting to foreign supplier and then foreign supplier sending commission to assessee, in effect, commission was paid to assessee on behalf of foreign supplier only and can be deemed to have been paid in foreign exchange as buyers. Comment: As per Place of Provision of Services Rules, the place of service in case of intermediary service is the location where intermediary is located. If commission agent is in India, it shall not amount to export of service. The Tribunal has adopted very liberal approach as to fulfillment of requirement of receiving consideration in foreign currency. Background: Assessee procured inputs Additives from both indigenous & imported Sources. After payment of duty, BOE endorsed to IOCL who took Cenvat Credit on basis of said BOE. Revenue contended that endorsed BOE is not valid document for taking credit. Issue: Whether credit can be taken based on endorsed BOE? Decision: There is no difference in BOE & endorsed BOE. Assessee has in fact endorsed BOE on basis of which credit was taken. Credit on basis of endorsed BOE can be taken subject to verification of receipt of entire consignment & their utilisation in manufacture of dutiable finished goods. and incidental to sale of plant. Issue: Whether assessee is liable to pay service tax on supervision of erection and commissioning of plant? Decision: The contract is for supply of plant. Installation and supervision services are incidental to supply especially when these are mentioned in the contract as rendered free of cost. When VAT has been paid on gross amount, service tax cannot be levied. Background: Assessee took credit on Courier Bill of Entry. Revenue contended that Courier Bill of Entry not proper document to avail credit as per Rule 9 of CCR. Issue: Whether credit allowed based courier bill of entry? Decision: Rule 9 of CCR prescribes that credit is available on the strength of bill of entry. There is no classification of bill of entry based on courier or otherwise. Courier bill of entry eligible document for taking credit. Background: Appellant constructing school building subcontracted site formation and excavation service for foundation of the school building. Subcontractor paid service tax under said category. Appellant contented that activity undertaken by the subcontractor is construction of the school building and no tax was payable and hence same should be refunded. Issue: whether appellant can get refund of such taxes paid by the sub contractor by changing classification of service? Decision: Subcontractor had paid tax under site formation and excavation service. He did not contest classification of service. Contractor cannot be allowed refund by reclassifying service under commercial or industrial construction. Background: Assessee availed credit on common input services used in providing both dutiable and exempted services. Option to reverse service tax on fixed percentage exercised at later date in relation to past period also. Issue: Whether assessee can exercise option under Rule 6 retrospectively? Decision: It was held that though assessee had not opted option in the past but the option may be exercised at later date also. There is no bar for making payment as per prescribed percentages for prior period also. Comment: Failure to intimate department of particular option under Rule 6 is merely procedural non compliance. Background: Assessee providing service of authorized service station and charged VAT on lubricants and spare parts shown separately on invoice. Department contended ST applicable on material portion also as it has been consumed while providing taxable service. Issue: Whether service tax is payable on the value of material on which VAT has been paid? Decision: It was held that When value of goods used is shown separately in invoice and on same Sales Tax/VAT has been paid, supply of goods would be treated as sale and not leviable to service tax. Background: At the time of making payment of service tax through challan assessee had mentioned the registration number of it’s another branch on challan. Issue: Whether adjustment of service tax paid under wrong registration number is permissible? Decision: It was held that legal person of both registrations is same entity and the issue is of rectification of unintentional error committed by assessee. Trade notice issued by the Cochin correctly provides that mistake committed in remittance of service tax should be sorted out with primary adjudicating authority and assessee not to be asked again to make payment. Background: Assessee supplied manpower for job work in factory of manufacturer. Charges for job work are based on the quantum of production and not against supply of manpower. Department demanded service tax under the category of manpower supply service. Issue: Whether job work charges liable to service tax (under manpower supply service or Business Auxiliary Service)? Decision: Job work carried out on behalf of manufacturer. Charges for the job work are based on the quantum of production and not against supply of manpower. Therefore activity remains as production on behalf of the client in the factory of the client, not manpower supply. Manufacturing activity also stand excluded from Business Auxiliary Service. No liability of service tax. Background: Assessee taking credit of service tax charged by distributor on commission paid to him for selling goods. Credit denied on the ground that it is not sales promotion activity. Issue: Whether the activity of selling of goods could be treated as sales promotion activity and assessee can get credit of service tax paid? Decision: There was nothing in agreement for carrying out any activity by distributor in the nature of sales promotion on behalf of the assessee. Mere stocking and selling of goods does not amount to sales promotion. Relied upon Guj HC judgment in case of Cadila health care and held that commission paid to distributor for selling of goods is not a sales promotion activity and hence credit not eligible. Comment: There has been amendment in the definition of input service vide Notification 2/2016-CE by inserting an explanation that sales commission in relation to sale of dutiable goods shall be considered as sales promotion. This amendment expected to put rest all frivolous litigation in this area. Issue: Whether credit can be taken as the appellant is not the owner of the capital goods? Decision: It was held that Law does not prescribe that the claimant of capital goods credit should necessarily be owner thereof Hence, credit is allowed on such capital goods. Background: Assessee is providing intermediary service to postal department. Postal department is paying service tax on total value of these services and availing Cenvat credit. Department is demanding service tax from assessee on ground that assessee is separate service provider and liable to pay service tax. Issue: Whether assessee is liable to pay service tax on intermediary services provided to postal department? Decision: Based on decision of tribunal in case of DNS Contractor Vs Commissioner of Central Excise, Delhi- I, if the service tax liability discharged on the full and complete value by main service provider, sub- contractor many not be liable to the extent services provided based on revenue neutrality. Comment: The ratio of judgment may not hold good in negative list regime in view of section 66F (1) which specifically provides that reference to a service shall not include a service which is used to provide such service i.e. each of the service should be treated separately. Background: Assessee obtained centralized registration and included the branch office in J&K in the registration certificate. Certain capital goods were installed in J&K on which credit was taken. Issue: Whether credit on capital goods installed in state of J & K be availed? Decision: Branch office in Jammu & Kashmir from where no taxable service is provided by virtue of Section 64(1) was not required to be included in centralized registration. When there is no liability to pay service tax from there, credit on capital goods can also not be allowed. CCR, 2004 does not apply in J&K. This material and the information contained herein prepared by Hiregange & Associates intended for clients and other chartered accountants to provide legal updates on indirect tax and is not an exhaustive treatment of such subject. We are not, by means of this material, rendering any professional advice or services. It should not be relied upon as the sole basis for any decision which may affect you or your business.